inattention involves difficulty sustaining attention to task, attending to details, organizing spaces and tasks, etc. Are the behaviors part of a long-standing pattern? How frequently are the symptoms displayed? Are the behaviors consistent across multiple settings? To what extent do the symptoms impact a person’s functioning in their personal and professional or scholastic lives? Can the behaviors be corroborated by others? Many doctors use a questionnaire and interview format that takes several hours. Some doctors also use a battery of neuropsychological tests for diagnosis. Children outgrow ADHD as they age. If the person would put in more effort, everything would be fine. Medication is the only way to treat ADHD. 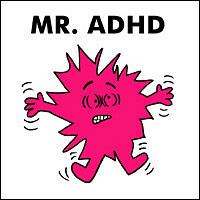 In reality, ADHD is a family of neurobiological disorders that affect several areas in the executive functions. … I never get anything finished.” ADHD’ers are prone to starting lots of projects but finishing few. This happens for a variety of reasons, the most prominent is boredom. It’s exciting to start something new, but sustaining the motivation to finish the project is another matter altogether. If it is a joint project, bill yourself as the idea person person who gets things started and assign someone else to be the completion person. Break the project into smaller tasks and reward yourself when each task is finished. Purchase limited quantities of new supplies for different portions of the project. Maybe new post-it notes for one part and new highlighters for another. Plan in breaks. If you work for 50 minutes and take a 10 minute break, it allows your mind to refresh and the task may not seem as tedious. 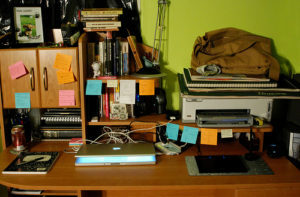 … I can’t get organized.” My first question is “what does organized look like to you?” Your vision of “organized” may differ from someone else’s. In which case, the methods you use to get organized will be different as well. Second, as an ADHD’er, you are drawn to colors, fun and brainstorming, but maintenance is a struggle. So while setting up systems is exciting, keeping them up is boring. So you need to create fun but simple systems to organize your stuff. You also need to establish a strategy for upkeep. That plan might include delegating the maintenance piece, devising a game to help with upkeep or developing a reward system when you manage your space well. Third, “traditional” organizing systems may not work well for you. As such, it might be difficult for you to read a book and implement ideas or use methods that work for friend or colleagues. Instead, your sources for organizing approaches will be ADHD websites and professionals such as coaches or organizing experts who specialize in working with people with ADHD. … everything takes longer to complete than I expect.” This shows up in several ways. One way is that you don’t even consider how much work a project involves so you plan very limited time for it’s completion. Another way is that while you account for the various facets of a project, you mis-estimate how long each step will take. So how do you bypass these issues? Ask “what occurs next?” when dividing a project into tasks. A related query is “how does happen?” which is a cue to help you determine when a phase is missing. By asking questions throughout the planning process, you are less likely to overlook steps. Think time-and-a-half. If you estimate that an activity will take 30 minutes, plan for 45 minutes. I’m sure you’ll find something to do if you end up with an extra 15 minutes. Just don’t forget to set a timer. However, if the job takes the whole 45 minutes, then you are still on schedule. For additional information about ADHD, check out the Minding Your Matters downloadable ADHD Resource page. Minding Your Matters organizing professionals have specific training in order to work effectively with people with ADHD. Contact us for more information.